The La Quinta Memphis Downtown is not only in a great location, but also provides guests with many complimentary amenities like free parking, breakfast, and WiFi! See why we believe this new downtown hotel is one of the best places to stay in Memphis, Tennessee. It was our first time in Memphis, so we wanted our hotel to be in a central location. Luckily, the La Quinta Memphis Downtown is one of the best places to stay in Memphis because of its close proximity to many attractions, including Beale Street. It’s also one of the newest hotels in downtown Memphis. The La Quinta Memphis Downtown is one of the newest hotels in downtown Memphis. Photo Credit: LQ Memphis Downtown. This La Quinta was not at all like some of the others we’ve stayed at in the past. This brand is reinventing itself! They’ve ditched the traditional orange color palette and have created a hotel with modern amenities in purple and gray hues. We loved everything about this La Quinta in downtown Memphis! As we walked into the hotel, we loved how open, bright, and modern the lobby was. We also loved the color scheme (purple is Vicky’s favorite color). Check-in went smoothly and as we were finishing up with the friendly woman behind the counter, we took a second to look around a bit more. Yup, we were really loving the decor. Talk about a nice room! We had a pillow-top king size bed, 50-inch flat screen TV, a desk, microwave, refrigerator, coffeemaker, and of course, free WiFi. The bathroom was also really spacious, with nice toiletries. Again, we were loving the modern feel of the room and all the purple! Breakfast is included at the hotel, which we always appreciate. There were eggs, bacon, waffles, breads, cereals, fruits, and pastries. There was also plenty of coffee and various juices. One of the things we loved the most about the property (besides the great location), is the fact that parking is free. That seems harder and harder to find nowadays. The hotel also has an indoor pool and a gym. We didn’t get a chance to try either, but they looked pretty nice. We loved our stay at the La Quinta Memphis Downtown. It was an easy drive to most of the places we wanted to see during our visit, the staff was very friendly, and there were many complementary amenities. You can find out more about the hotel by visiting their website. 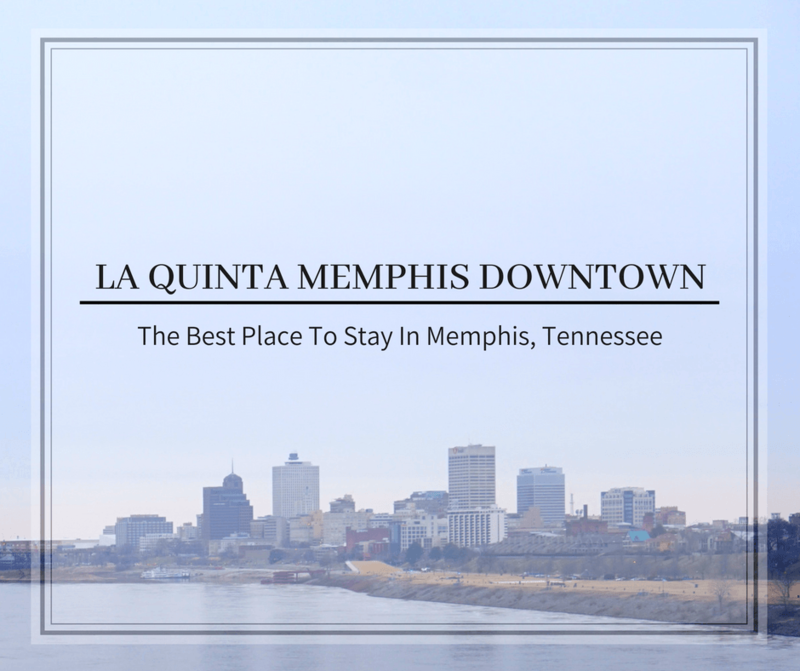 We definitely recommend the La Quinta Memphis Downtown! I have never seen a hotel look like that from the outside. Like a big rectangle. Minimalist design in some ways. So cool. Noted for any trips to Memphis. You’re right; they have changed up their look! Looks very clean, stylish and modern — I like it. Thanks for sharing! Bravo, La Quinta! The brand is really stepping up their game. This is unlike any of their hotels I’ve seen before. I’m actually very impressed. Contemporary and cozy. I like that combination a lot. The colors used in the interiors are vibrant and chic. Nice choice of hotel. Such a nice hotel to stay at. I really love the decorations of their room, it’s so relaxing, clean, neat and the bed looks so comfy. It is also nice that you can enjoy a meal in a relaxing place like this and enjoy some dip in the pool. Thanks for sharing! The La Quinta Memphis Downtown looks like a comfortable and convenient place to stay. Love the fact that it is so strategically located near major attractions. The interiors seem to be so bright and elegant. I especially liked the look of the indoor pool. Sounds like a nice stay experience in the La Quinta Memphis Downtown. I love purple! Love the color of the room! Also how comfortable it is! A hotel which is accessible to almost anything is a big yes! La Quinta Memphis is indeed a great hotel to stay and I like the fact that their staff were kind! It’s one of the most important to look for in a hotel! I am digging the new modern color scheme. It really looks sleek and something I would expect to cost way more than rooms do. I love exploring downtown Memphis when I am in Tennessee. I love the music scene down there. Seems perfect in terms of comfort. The contemporary decor is quite cheerful and pleasing. And I love a place with tons of breakfast options. This one is a perfect start to a day full of exploration. Well taken pictures. This location looks great! Free parking and a pool are always two things on our family hotel musts list! Will definitely check out the Downtown Memphis La Quinta when we are in town!